According to an estimate of the IMF, growth in the global economy in 2018 was, at 3.7%, 20 basis points lower than anticipated at the start of the year and also slightly below the growth achieved in the prior year (2017: 3.8%). Over the course of the year, general economic uncertainties increased steadily. In particular, the ongoing trade conflicts and punitive tariffs between the U.S. and China, increasing concerns about China’s growth prospects and political uncertainties, for example with regard to Brexit or Italy’s budgetary policy, led to a marked slowdown in global economic growth in the second half of the year. As a result of the increasing uncertainties, the manufacturing sector and capital expenditure also suffered. While the U.S. economy expanded further in 2018, mainly due to the positive impetus of the tax reform, the economic development in Europe and in many emerging markets lost perceptible momentum over the course of the year. 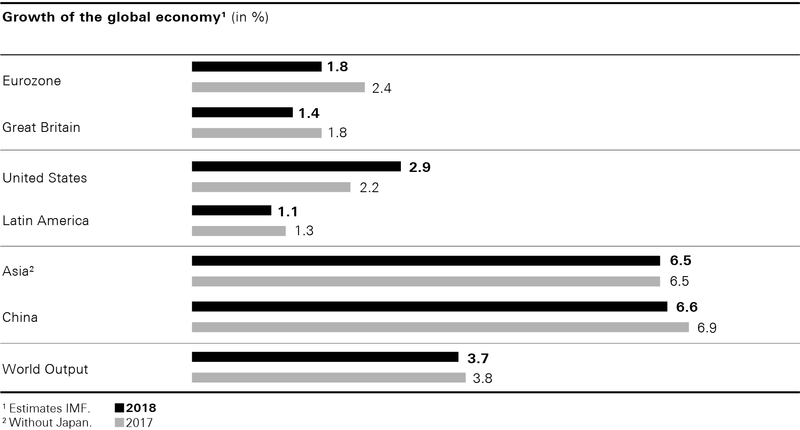 According to an IMF estimate, the economy of the Eurozone grew by 1.8% in 2018 and thus clearly less than initially expected (2017: 2.4%). Although it still benefited from the expansive monetary policy being pursued by the ECB and generally upbeat consumer confidence, lower growth in exports and increased political risks caused a perceptible slowdown in economic momentum. Germany, France and Italy in particular saw a weaker development than in the prior year and weaker than had been expected at the beginning of the year. Compared with the Eurozone, in Great Britain, the economy grew at a below-average rate of 1.4%, also lower than in the prior year (2017: 1.8%). The IMF estimates that, at 2.9%, economic growth in the United States was considerably above the prior year’s level and slightly above the expectations set out at the start of the year (2017: 2.2%). The robust economic growth in the United States was driven in particular by the private sector, which benefited from the tax reform and higher government spending. Growth of the Canadian economy was slightly down compared to the prior year’s level. According to IMF estimates, growth in economic output in Latin America also remained down slightly from the prior year at 1.1% (2017: 1.3%). According to the IMF estimate, the economic growth of the emerging and developing markets of Asia equated to 6.5% during the past fiscal year and was thus, as expected, at the prior year’s level (2017: 6.5%). While the growth rates of smaller emerging markets continued to rise in the past year, the IMF expects economic growth for China to have slowed to 6.6% (2017: 6.9%). The trade conflict with the United States and the resulting punitive tariffs on Chinese exports, the increasing indebtedness of the private sector and a downturn in consumer confidence burdened the Chinese economy. The Japanese economy grew only slightly last year. In a joint study, The Business of Fashion and the consulting firm McKinsey & Company estimate that sales of the global apparel industry increased by between 4% to 5% in 2018 when adjusted for currency effects. Growth was hence significantly higher than in the prior year (2017: 2.5% to 3.5%). Key drivers included strong demand for apparel in both the luxury and value segments, U.S. industry sales benefiting from the tax reform and higher demand in emerging markets. For HUGO BOSS, the upper premium segment of the apparel industry represents the best benchmark. The Business of Fashion as well as McKinsey & Company estimate that the growth of this segment was only slightly behind that of the industry as a whole and stood, as in the prior year on a currency-adjusted basis at 3.5% to 4.5% (2017: 3.5% to 4.5%). A high level of demand especially from Chinese customers for premium and luxury goods, the strong U.S. business and robust growth in the emerging markets had a positive impact on conditions in the industry. However, these were still marked by substantial regional and company-specific differences in 2018. In particular, those market participants who were able to increase their brand’s appeal among younger customers by means of innovative, attractive collections and a persuasive digital approach performed well. According to estimates by The Business of Fashion and McKinsey & Company, the apparel industry in the mature countries in Europe grew on a currency-adjusted basis by 2% to 3% and thus at a similar rate as in the prior year. Growth in the region’s emerging markets was up to four percentage points higher. The appreciation of the euro led to a slight weakening of business with tourists. However, the region benefited from a slight overall increase in local demand, with the individual markets showing marked differences, those in Great Britain and Germany in particular performing below average. In America, the recovery of the apparel industry continued in 2018. The Business of Fashion and McKinsey & Company estimate that the sector in North America, with currency-adjusted growth of 3% to 4%, developed better than in the prior year and thus stronger than expected at the beginning of the year. In the U.S. market, the development of the industry was supported not only by the tax reform but also by business with tourists. In Canada and the markets of Latin America, the industry also reported sales increases. In Asia too, there were regional differences among growth rates in the apparel industry. According to the estimate of The Business of Fashion and McKinsey & Company, while the industry in the mature markets of the region only saw growth in the single-digit range in 2018, the emerging markets of the region, including the markets of China, Hong Kong and Macau, which are important to the industry, recorded a currency-adjusted sales growth of 6.5% to 7.5%. The industry was thus able to grow more strongly than in the prior year, thanks in particular to strong demand from Chinese customers. Many of the market participants are becoming more successful at adapting to the needs of younger, increasingly fashion-conscious customer groups on the Asian market who are strongly influenced by social media.